One of the many things we fell in love with on our trip to Dubrovnik, Croatia was arancini, or candied orange peel. It's a pretty common souvenir that you kind find everywhere there. We were wary at first, imagining it would be horribly bitter, but when our sweet airbnb host offered us some she had made herself, how could we to refuse? We enjoyed nibbling on it every day throughout the rest of our stay and brought bags of it home for our family and friends. I've wanted to try my hand at making it myself ever since and I did just that over the holidays this year. They turned out perfectly, just like we remember, and they were a cinch to make. It's the perfect winter treat to sweeten up these bitterly cold days. 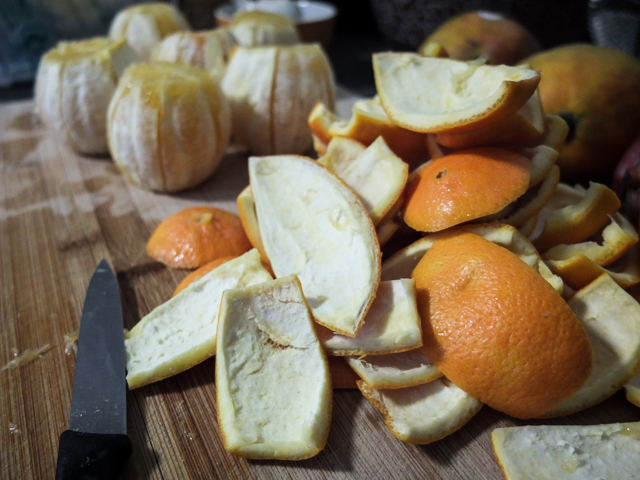 For one, orange peels are super healthy, helping to fight everything from cancer to the flu. To think we normally just toss it in the trash. Sure, all that sugar may contradict the health benefits a tad, but it's not like you're going to eat it all in one go, like you may have done with the dozen cookies you baked last week (ahem). They're just sweet enough to feel like you're getting a treat but bitter enough to prevent gluttony. It's a nice breath freshener in the morning too. Plus, you're left with a bunch of pre-peeled oranges for fresh juice and smoothies! Win win win! I followed the "thick" recipe pretty much word-for-word from the Remedial Eating blog. She had both a thick and thin version, which I found a little confusing to read through, so I've reposted it below with just the one I used. But promise me you'll take a moment to read her post too, as it's illustrated beautifully with her own photography and stories of her mother making these every Christmas for her as a child. I hope it becomes a tradition in our family as well! 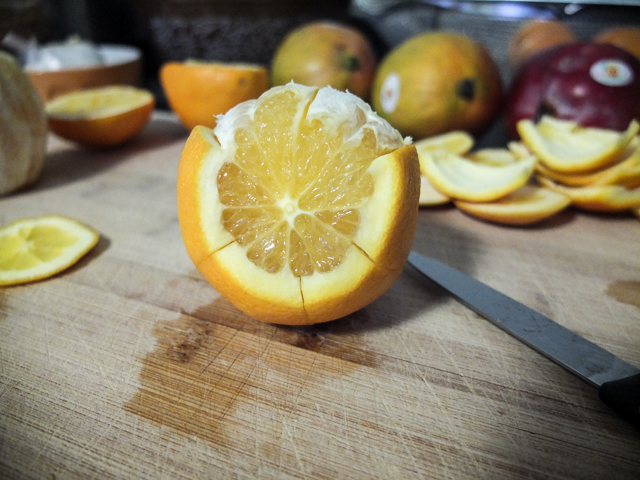 Peel oranges: With a sharp paring knife, slice both ends off each orange, then score the peel, top to bottom, four or five times, just down to the fruit. The goal here is to easily remove the peel in diamonds, mostly intact. Remove each quarter/section of peel from the fruit. I candy the tops and bottoms, as well, punching out the stems, and adding the remaining "donuts". They will not be elegant, but they will be delicious, excellent for baking or solo nibbling. 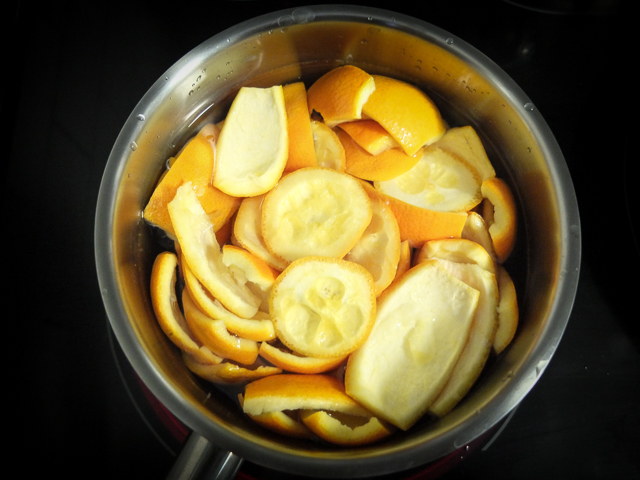 Blanch Peel: Place sliced peels in a medium saucepan, fill with cold water, and set over high heat. Bring just to the boil, then drain. Repeat this twice more, starting with cold water each time. After draining a third time, use a small sharp knife or baby spoon to scrape only the thickest, mushiest bits of pith from the interior. Discard. The firm pith can remain; it will sweeten in the next step. Then, slice each diamond into long, thin strips or triangles, 1/4 - 1/2" across. If you are using the tops and bottoms, roughly chop those, as well. 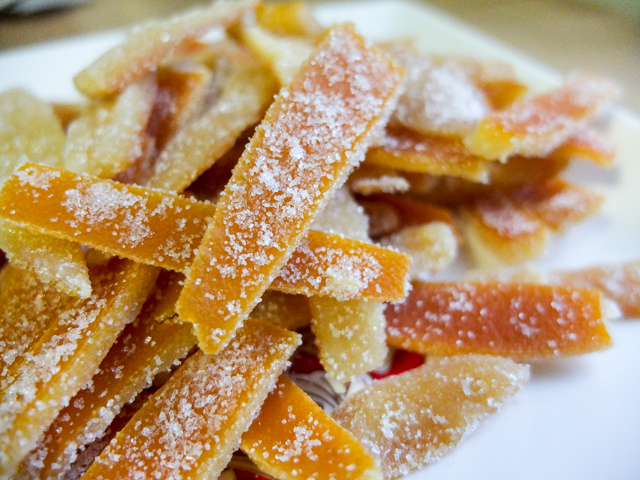 Candy Peel: Combine sugar and water in the same saucepan. Stir over low heat until sugar dissolves. Add peel, and simmer uncovered, gently, until syrup thickens, stirring occasionally, around 60 minutes. You can judge doneness by sight: when the peel turns translucent, it is finished. Finishing: Set a strainer over a small bowl, and drain finished peel, catching syrup below. (The "waste" syrup is intensely orange and aromatic, excellent mixed into sparkling water, smoothies, or likely, a favorite cocktail.) 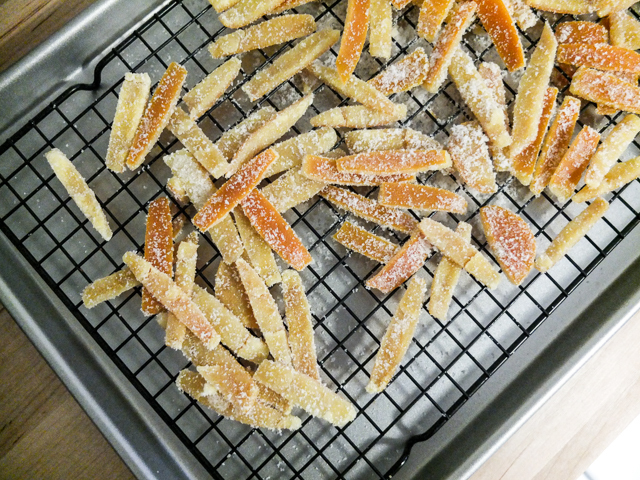 Set a wire cooling rack over a large rimmed baking sheet to catch drips, spread candied peel in a single layer on the rack, and allow to cool and dry for 1-1/2 to 2 hours. 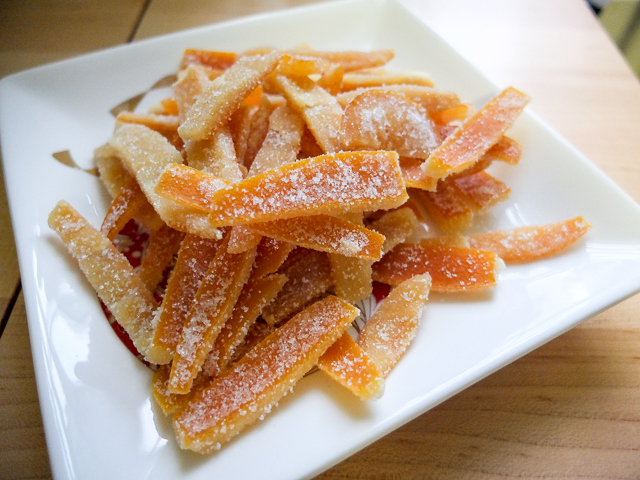 When peel is no longer wet but still tacky, pour a layer of granulated sugar (1-2 cups) onto a tray, and toss peel well in the sugar, until thoroughly coated. You can then transfer the peel to a lidded glass jar, and store in the fridge, where it will keep beautifully for months. I prefer to let it harden a little more by letting it sit out for another 1-2 days before transferring it to tupperware. But that's up to you.